This course provides students with an introduction to several health care careers such as Central Supply, Radiology, Rehabilitation Services, Dentistry, and Pharmacy. Students will also cover safety practices, infection control and various types of communication in the healthcare field. This course provides students with an introduction to several healthcare careers such as Respiratory Therapy, Emergency Services, Medical Laboratory and Biotechnology Services. Students will also learn about safety, infection control, and teamwork. 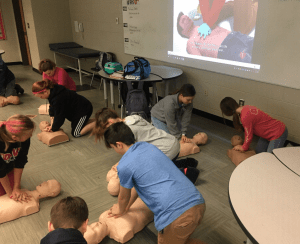 Students will also learn CPR during the semester. This course is a Carnegie course. Introduction to Healthcare Science is the first of three courses to complete the Healthcare Pathway in high school. The information covered in this course will include employability skills, safety practices, healthcare delivery systems, diversity and ethics in health care, legal responsibilities as a health care provider, electronic medical records, human growth and development and emergency services. In the emergency services unit, students will learn CPR and First Aid.